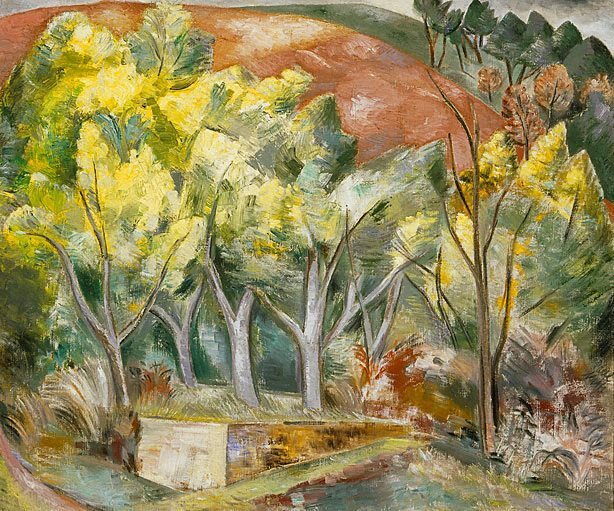 It is most likely that Nash made the preparatory sketch for this work in the early months of 1925 whilst he and his wife stayed at the Pension de la Plage in Cros de Cagnes, France. The Mimosa wood could be seen from their bedroom window. Signed l.r., grey and black paint "Paul Nash". Not dated. Arthur Tooth & Sons Ltd, 21 May 1946-22 Nov 1946, London/England, Purchased by the AGNSW from Arthur Tooth & Sons 1946. Purchased by Tooth's from Christie's London, 21 May 1946. Modern Britain 1900-1960 , Melbourne, 2007, 188, 189 (colour illus.). Art Gallery of New South Wales catalogue of British paintings , Sydney, 1987, 135 (illus.). Modern English painters Lewis to Moore , London, 1956, 109. Paul Nash: the portrait of an artist , London, 1955, 156.